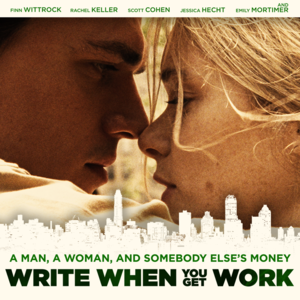 New Jersey native Stacy Cochran will be at Hopewell Theater on Friday, March 1 at 8 pm for a screening of her latest film WRITE WHEN YOU GET WORK — a thorny romantic comedy set in New York City at a private school for girls and in the world outside its exclusive walls. Jonny Collins is still in love with Ruth Duffy, and he has been since they were kids. But Ruth has slipped away from him and their corner of the Bronx under the Throgs Neck Bridge. Instead she has landed on the lower rungs of the Upper East Side with a job and small apartment. One day when Jonny spots her, even locked doors and windows can’t prevent him from breaking back into her life. She can barely stand the sight of him and yet she can hardly breathe without him. Love and money. Crime and happiness. The fizz among strangers. Write When You Get Work is the story of the bond between two people. Stacy Cochran is a director, producer and screenwriter based in New York City who made her feature debut with My New Gun starring Diane Lane and James LeGros. The film premiered in the Director’s Fortnight section at Cannes and earned an Independent Spirit Award nomination for Best First Feature. Her next film Boys starred Winona Ryder and John C. Reilly, which was then followed up with a short documentary about Richard Lester. After an eighteen year hiatus, she completed Write When You Get Work which was shot on Super 16mm film by Oscar-winning cinematographer Robert Elswit. The movie premiered in Narrative Competition at SXSW in March 2018. Director Stacy Cochran will introduce the film and will be around after the film for a post-film Q&A. Tickets for the event can be purchased here. Get your tickets today!